Sophie came into our home when her foster mom took a week's vacation. 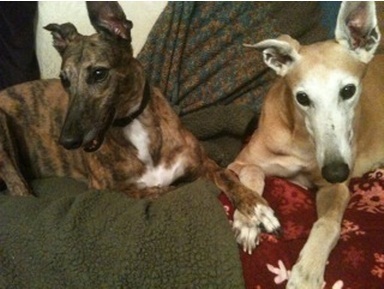 We love the bittersweet job of fostering Greys who are transitioning to a new and happier chapter in their life -- finding their forever home. It requires guarding your heart while you perform the sweet duty of preparing them for life in a human's house. Sophie was different than all the others. She was scared, hand-shy especially of men, but so sweet. A big cuddler and big on kissing your hand when she approached. She easily took her place next to our greyhound, Velcro and even won over the queen of the house, lab mix Sami -- not an easy feat! Sophie is now our second "failed foster." One who lodges easily in our heart and our home.